I spent HOURS reading reviews for so many other jumperoos and with all the negative comments I heard about so many others, I was really hesitant to buy one at all. But the Fisher Price ones seemed to have the least amount of problems and when they did, Fisher Price seemed keen to fix them. So I knew I wanted a Fisher Price. And since this is their newest model, I figured many of the problems with the other jumperoos would have been fixed. As far as I can tell, they were for the most part. 1. the toys are not overwhelming. they are simplistic and keep my daughter entertained endlessly. 2. The music is not overly annoying and when set on the low sound level, can’t really even be heard once away from the music. 3. I love the bouncy music feature that makes noises and giggles, etc. when she bounces. She hasn’t really caught on yet, but it keeps her entertained. 4. The red bird came with some paint scrapes on her face but I tried to scratch at them with my finger nail and nothing came off, so I wasn’t worried about paint chips like some of the other jumpers had. 5. The colors are great, but not overwhelming. They are perfect for her and keep her attention. 6. The springs are fabric covered and so far have held up through LOTS of enthusiastic jumping. 7. The base seems really stable. When she bounces the arms barely move and the base not at all. 8. My only complaint – the leaves from which the rhino and monkey hang are supposed to SNAP in but I couldn’t get them to and she is able, when she pulls hard enough, to pull the leaves actually out of the arms and get to the toys that way. I wish they had a better locking mechanism so they couldn’t do this. 9. One other complaint – the hanging rhino and monkey catch her interest and she tries to pull at them but can’t really hold on to them. I almost wish they were on a stretchier cord so she could get to them when she wants to. 10. Ironically, her favorite toy is the plain teether. She spends more time with that than any other. It is nice that it has a teether on it so she can have one toy that is sort of relaxing and doesn’t make noise etc. if she ever just needs a break. 11. There is a small tray for snacks – some of the other reviews thought this was pointless and took up too much room, enough room for another toy instead. But this tray is very small and doesn’t keep any other toys from being attached. I am glad there are no other toys on this tray because then I think it would be overwhelming. All in all, I love this jumper. We haven’t had any problems after one month. Certainly no issues like so many of the other jumpers have. She stays endlessly entertained and would stay in her jumper all day if I were to let her. If any of the Fisher Price issues come up I will update my review, but for the tme being, we love it and have had no problems! The Luv-u-zoo is for a taller baby. Our son’s feet reached the floor for a couple weeks before we left home in the rainforest jumperoo. Here we just took out the books used to make him tall enough to jump. In addition, the bigger problem is that the seat’s lip is taller in this one and wider, so it is much harder for him to reach toys. On the rainforest jumperoo, there is a green bar with three animals hanging or attached to it- an elephant facing the wrong way, a red bird, and monkey. He enjoyed playing with the bird and the monkey a lot. The bird swung with his bounces, so it kept him especially occupied. On the Luv-U one, there is a hippo rattle that he can spin around. But it isn’t nearly as interesting or interactive for him as the bird and the monkey. Our son does like to twirl the red bird and the discs on the giraffe bar of the Luv-U, but watching them is uninteresting for him. Lastly, instead of the hippo rattle, the rainforest has a smaller colorful rattle that our son played with much more than he plays with the hippo! Partly it might be the colors, but mostly I think it is because he could reach it better. They both have lights that react to the music/sounds- rainforest has 3 and luv-u has 2. Our son loves the teether on the Luv-U. The string makes it hard for him to grab on his own yet (4.5 months), so I have to give it to him and/or hold it in his mouth. The Rainforest has an insect(?) on a plastic cord that is much easier for our baby to grab and hold onto. On the Luv-U, behind the teether is another rattle. Rainforest’s rattle is very similar. They both have color wheels that babies can spin. The Luv-U also has a toy where you can push beads back and forth, and a little mirror. I bet our son will love pushing them when he gets older. The mirror interests him, but he can’t see himself in it as it is practically facing the ceiling. The Rainforest has a pop up tiger whose mechanism probably is too advanced for our baby and it has a rainbow bar that he loves to look at with a sun rattle. The Luv-U is easier to get him into and out of and is more roomy. The rainforest swivels much much easier- he was already moving around at 3.5 months. The Luv-U barely moves at all with him kicking off and jumping. I prefer the Rainforest seat since he can move himself to different toys if they catch his interest. I love the Rainforest’s music. The Luv-U is also nice, but the rainforest has my favorite music of any baby toy I’ve heard! The Luv-U is more sensitive to the baby’s movements and makes sounds for every movement he makes. Some people might love this, I get sick of the boinging, the fake baby laughter, etc. I have grown to like the music for the Luv-U, but I miss the Caribbean sounds of the Rainforest! So why the high rating? 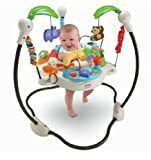 It isn’t nearly as good as the Rainforest Jumperoo IMO, but it is still a great activity toy for babies! If you don’t have a choice, get this. If you do, get the Rainforest Jumperoo! My daughter is 4m old and stands 24.75 inches tall. Just so parents know she cannot touch the ground even on the jumperoo’s lowest level (they don’t list a minimum height on the box anywhere, but I just put a pillow under her feet). Also so you get a perspective of size, my daughter weighs 13.5 lbs. and there is a sufficient amount of extra space in the seat for her to grow into. she does love being bounced in it and loves the rattle toy. She is still taking in the other toys as they are slightly advanced for a baby her age. I bought this toy because she likes to be upright or sitting most of the time and I put her in it while I fold laundry or do dishes (be sure you keep your baby in eye sight). She will look at all the stuff and occupy herself for about 15 minutes. The toys and activities are cute and capture her attention and I find the jumperoo to be sturdy. *Update: My daughter is now 6 months old and can touch the floor in the jumperoo (on the lowest level), still has plenty of room to grow in the seat and loves playing with the other toys. She has figured out how they all work now. I love that she was able to grow and develop with this toy. She will play for 15-20 minutes at a time. This is good quality set with great chimpanzee sound. I really don’t see why they had to put the whole family when they all sound the same. The animals are cute. But three “same” animals make cluster in the zoo set and also raise price on them. Also this price is outrageous. FP site has it far more cheap.